DRY-FLY DESIGN has been the subject of many discussions with one of my longtime fly-fishing partners, Nick Pionessa, who is a full-time fly tier. His flies end up in some of the better-known shops in the country. We agree that perhaps one of the more important aspects of a dry fly is how visible it is on the water. Not only does this let you see when a fish takes the fly, but it allows you to see how the fly is drifting, as well. A drag-free drift is often essential to fool a discriminating trout. Unless you can see the fly clearly, it is difficult or even impossible to tell whether you are making a good dead drift. A poor drift results in more refusals than does poor fly selection, so you need to be able to follow the path of the fly to read the impact of the subtle currents that often cannot be seen just by looking at the water’s surface. This is especially true when you are making long casts. Being able to see the fly lets you make adjustments to your presentation or position to obtain the proper drift. With a high-visibility fly — one you can see from a long way off — you can easily track your drift and see whether the trout that just rose ate your fly or a natural drifting alongside it. The challenge is to produce flies you can see from a distance, but without compromising their realistic appearance. Happily, the fly needs to look like a natural insect only from the fish’s point of view. This usually allows for some flexibility on the top of the fly. Highly visible wings, posts, or small pieces of foam tied in on the top will dramatically improve how easy it is to see the fly. At the same time, the fly’s key elements — such as the body, tails, legs, or shuck — can still offer an impressionistic look from underneath. For convenience, I split my mayfly patterns into three categories-duns, emergers, and spinners. Let’s take a look at how to enhance the visibility of each of these types. For duns, I use three basic design types: thorax dun, parachute, and Comparadun. For the wing on the thorax dun, I use a reflective material that’s stiff enough to stand as the wing. Aero Dry from Umpqua Feather Merchants works great for this. It comes in a variety of colors for the mayfly color schemes most of us work with. For example, the medium-dun Aero Dry has the natural appearance of a mayfly wing, but the sheen allows it to show up well when there is any daylight. For angling in very low light, I prefer a lighter wing. However, if there’s glare on the water, oftentimes a black wing shows up better than a light one. 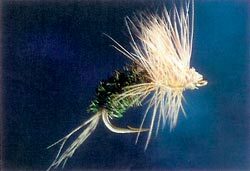 Parachute-style flies tied with a wing post made from light synthetic materials or white calf tail show up very well on the water and allow the fly to ride low. I prefer white to fluorescent colors because the white seems to stand out best against the water’s surface. 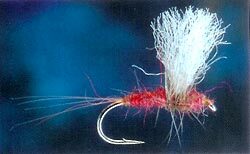 I also tie many of my Comparaduns with wings made of a light synthetic or light deer hair. However, I have found that fish sometimes shy away from Comparaduns with bright wings. Since a portion of the wing is riding on or even in the water, the fish may get too good a look at it and decide is doesn’t appear natural. The answer to this is to keep the wing small. This is especially important on small mayfly patterns such as Baetis imitations. Scaled-down versions of each of these patterns can be quite important to meet this hatch. 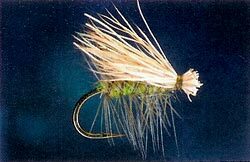 Mayfly emerger patterns seem to work best with wings made from natural, as opposed to synthetic, materials. Since the fly rides low in the water, natural deer and elk hair seem to do a better job of fooling a trout. The key here is to use a light deer or elk, representing a wing that is just unfolding. The best possible solution is to find hair with small, light tips and darker butts that match the color you want. 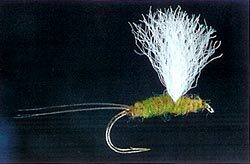 Spinners are among the most difficult flies to see on the water, which is why I tie them with a high-visibility post. Unfortunately for us, most spinner falls take place in the low light of the evening. A trout is usually not going to move far for a spinner, so you must drop your fly near its nose. If you can clearly see your fly, it greatly improves your accuracy and your ability to tell when the fish has taken your fly. But synthetic-wing spinners may not work well on finicky trout. A hackle spinner tied parachute-style is the perfect solution. Difficult fish seem more likely to be tricked by this style of pattern, which displays a spent-wing profile from below while providing you with a high-visibility post above. A pattern that works for little spinners such as Tricos is simply a minute Comparadun tied with white Aero Dry for the wing. It is quite visible for a very small fly and, despite its simplicity, has fooled some really nice fish for me over the years. When you’re dealing with tiny flies in low light, any edge you can get is important. Most of my caddisfly imitations are tied with light elk hair, which shows up remarkably well under most conditions. I usually use a darker elk when tying gray or black caddis, but in general fish do not seem to shy away from light elk wings. If I feel the wings need to be darker, I will add a white post or a tuft of white fur just behind a hackle collar. This trick works especially well on patterns such as a Slow-Water Caddis tied to imitate one of the dark species. For example, imitations of the little Mother’s Day caddis tied in the Slow-Water style can be almost impossible to see at any great distance, but become easy to spot if you just add a wing post. I also use light elk on my caddisfly emerger imitations. The Lafontaine emerging caddis is one of the most productive caddis patterns that I have used. Dressing it with light elk regardless of the body color makes it easy to see the fly even while it rides low in the surface film. Tufts of yarn or foam can be added to just about any terrestrial pattern, including ants, beetles, and hoppers. In general, the darker and smaller the pattern, the greater the benefit of adding some high-visibility elements. In late summer, flying-ant falls start in the midafternoon and continue into the sunset. A flying-ant imitation with a white post will allow you to fish longer into the evening and still be able to make out the whereabouts of your fly. And since this is the hour for some of the biggest fish, it is important that you can stay on the water. Another good place to fish a high-visibility terrestrial would be a deeply overhung grass bank. On a late summer afternoon, drifting a grasshopper or cricket imitation through one of those dark tunnels can get a rise from some surprisingly big fish. 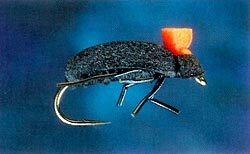 Being able to see your fly because you have tied it with a bit of bright foam at the head lets you set the hook when the big one eats it. My approach is to carry both visible patterns and those that have more of a realistic design for each hatch that I fish. If the lighting lets me see the realistic patterns, then I will fish those. However, when the lighting demands greater visibility, then I am ready for that challenge, as well. Of course, high-visibility flies are not just for low-light conditions. Often the longer the cast, the more difficult it is to see the fly. So I tend to use more visible patterns when fishing bigger waters.